The following letter was written by Thomas and Maria Pointer in Hopedale, Harrison County, Ohio in 1861. 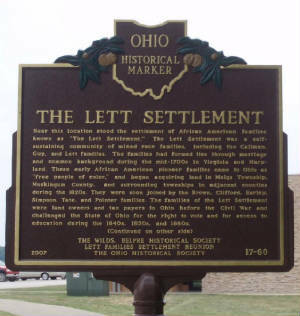 Thomas and Marie Pointer were residents of the Lett Settlement in Meigs Township, Muskingum County, Ohio. CITIZENS OF HOPEDALE :—On this day of general congratulation, and joy, and thanksgiving—almost throughout the entire limits of this country—we have ventured, tremblingly ventured, to ask for an opportunity, in behalf of our people, to present, humbly our petition, and to order our complaint. This is our native land, the home of our youth, and the place of our fathers’ graves. We have watered it with our tears, and sweat and blood.— Attachments, stronger than death, attachments which we can no more sever, than we can break the cords of affection that bind us to our own offspring—bind us to this beautiful country. But you have made us aliens. The highest tribunal of your country, has declared that we cannot be citizens. You have fastened upon us a badge of degradation, from which we have no power to es- cape. You shun our society. You treat us as a lower type of humanity, and no labor, no industry, no intelligence, no virtue or piety, will serve to relieve us from that terrible odium. The dreadful consciousness that we must live and die, and leave our offspring forever in this dark and hopeless condition seems to us at times, more than we can bear. But alas! citizens of Hopedale, this is but one item in the catalogue of our sufferings—you have converted four and a half millions of our number into articles of merchandise; denying us the rites of legal matrimony, herding us together, and separating us at pleasure. You take from us the control of our children; and in ten thousand instances tear them from our embrace, and sell them to the highest bidder like sheep in the market, by the head or by the pound. You have, in so far as you have been able, destroyed our humanity, and blotted out our intellects by depriving us of the privileges of learning to read even the name of God who made us, or of the Saviour who redeemed us. You drive us to our daily toil without wages; having taken from us all the means of defense, and subject us to a rigor of treatment, which has no parallel for horrible cruelty, in the annals of the world. When driven to desperation, some of us have turned with violence upon our tormentors, or made our escape; we have been tortured by the lash, or burned at the stake, or pursued by blood hounds, and all the power of the Federal government has been brought to bear for our recovery. And, as if something still was necessary to cap the terrible climax, you attempt to terrify us into submission to all these outrages by an appeal to the Bible, as a divine warrant for their perpetration. We have again and again, and again sued for a redress of our wrongs, but have only been answered by repeated injuries. We say you, citizens of Ohio, in presenting these complaints, because we know that it requires the power of this mighty nation to inflict the wrong and we must hold every volunteer element in that power, responsible for our sufferings. We could take care of ourselves, were the men who wield the lash, and sell our children, and follow us with blood hounds, the only parties with whom we had to enter into conflict. But there is not one foot of soil over which your banner waves, where we can enjoy the poorest rights of humanity. As one has truthfully said—should we take refuge in Fanuel Hall, the cradle of our liberties, or scale the shaft of Bunker Hill Monument in the cap stone, our persecutors can tear us from that cap stone, or drag us from that cradle, and establish their right to the possession of our bodies, dead or alive, before the highest tribunal of your country. You have covenanted that we shall be "delivered up." You have covenanted, that you will suppress insurrections. You have covenanted that all the political power, that is of right our own, shall belong to our oppressors. Will you not break that covenant with death? ‘Tis in vain to deny its existence—every time that one of our poor people, seeking for shelter and protection, passes through your village, you feel a painful consciousness, that in an evil hour, your fathers made these fearful promises, and that you have perpetuated them till now. "Will I not visit for these things, saith the Lord. Will not my soul be avenged on such a nation as this?" Will you not now say—will not the people of Ohio this day, in the depth of contrition, say frankly to those who are claiming our services, "We are sorry for the existence of this contract. We cannot live up to it—we must violate it, and take the consequences. If you are determined to compel the poor of our land to toil forever, without hope of reward, on you alone must rest the responsibility. the yoke, the putting forth of the finger and speaking vanity." That this may be the result, the happy result of the prayers and preaching, on this day of general rejoicing, o the part of our oppressors, is the sincere prayer of the humble and oppressed subjects of your government. In behalf of all the colored people of these United States.